In this season of Black-ish, the show has addressed some of its heaviest themes. When “I’m A Survivor” begins, it seems as though we’re going to get another difficult episode. Perhaps, one that explores the difficulty of having adulthood forced upon you when you grow up poor and black. Maybe, it would be an episode on the constant cycle of death and loss in poor black communities. Dre’s usual introduction sets us up for this as he recounts growing up with his crew and immediately discovers that his close friend, Tony, has died. But, that’s not what happens. Black-ish is a smarter show than that. Week after week, I’ve praised this season of Black-ish for merging intense conversations with comedy. “I’m A Survivor,” on the other hand, keeps humor at the forefront and reminds me of the show’s strongest earlier episodes. The premise of “I’m A Survivor” is Dre’s guilt over making it out of the ghetto. But, this isn’t really what the episode is about. While Dre tries to “save his crew” with expensive gifts, the episode only scratches the surface of “survivor’s guilt.” That’s fine, Black-ish is an episodic show that has the ability to jump from topic to topic each week. You want to understand the real complexities of survivor’s guilt in the black community? Well, watch Survivor’s Remorse. It’s a great show. But, “I’m A Survivor” isn’t here to focus on pain or loss––in fact, Dre pretty much spits on the grave of the deceased by the episode’s end. The episode’s real focus is on setting up your crew and chosen family to shine. While Dre focuses on money, surgeries and gifts to uplift his crew, the guest casting behind the episode actually enlightens that theme. Anthony Anderson is an amazing actor. This season of Black-ish has put Anderson’s talents on display, but anyone with a knowledge of Anderson’s previous work already knew he was a strong performer. His attempted ATM heist in Barbershop is one of the funniest plots in modern comedy (yeah, Barbershop is a good movie, I said it). 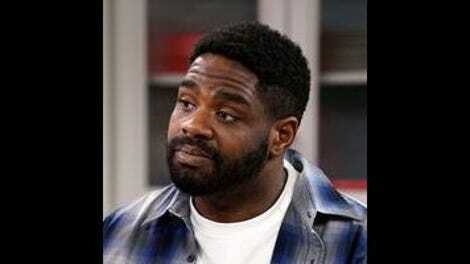 He’s been a welcome guest in shows like My Wife and Kids and The Bernie Mac Show. But, you’ll notice a pattern––Anderson’s fame has largely been relegated to “black” media. As my mom would say, he’s “black” famous, but not “famous” famous. Well, Black-ish has lifted Anderson to new heights and “I’m A Survivor” brings a number of “black” famous performers up with him. 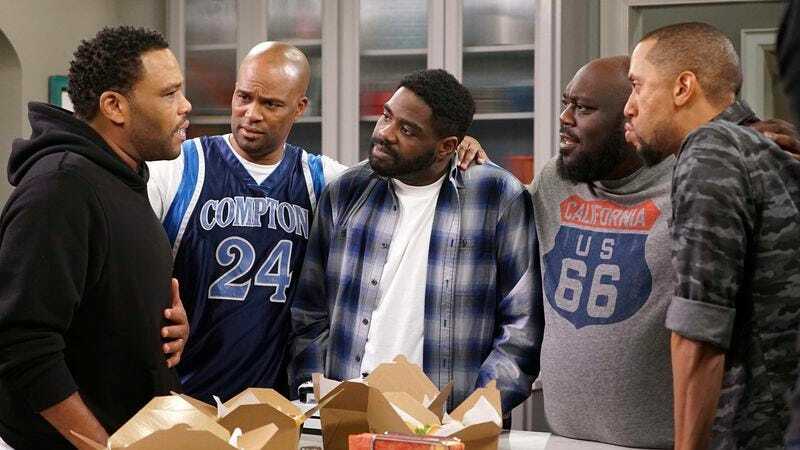 Faizon Love, Affion Crockett and Chris Spencer are staples in classic black media ranging from Friday to Don’t Be A Menace To South Central While Drinking Your Juice In The Hood to Def Comedy Jam. While Ron Funches is someone who has had crossover success, it’s mainly because of his focus on small, weirdo indie comedies. When I saw this crew’s credits in the episode, I was immediately excited to see the play between them and Anderson. It paid off. Spencer insisting Dre gave him the bike without a back wheel was wonderful. Crockett’s explanation that he’s a bad guy because he “sexed two women against each other” was one of the best lines of the episode. These men have always been amazing performers and it’s great to see them on one of the most talked about shows of the year. On top of that, it truly highlighted the growth of Marcus Scribner (Junior) as a performer. Scribner was given the difficult task of playing a character on the verge of puberty. The show has literally likened him to characters like J.J. Walker from Good Times because it would be so easy for him to simply be the nerdy, awkward middle child for the entirety of the show. In “I’m A Survivor,” Scribner holds his own in scenes with Love and Anderson and never loses his essence as a character. Junior’s desire to be a peer counselor is definitely aligned with his previous nerd interests, but he doesn’t feel like a distraction here. “I’m A Survivor” features death, but it isn’t an episode about loss or sadness. It’s an episode about the joys of black brotherhood and it’s great to see Black-ish take that message to heart in the guest stars it chooses to feature. MARLA GIBBS!!!!! MARLA!!!!!! I love that Marla is Dre’s grandmother. This was perfect casting and she was truly adorable. Bow and Ruby’s plot largely felt repetitive. We already know that Ruby thinks Bow isn’t a great mom, but it was worth it for that “Don’t you EVER lie to me about a four-square base!” line. “Grandma’s pie! Come look at Jesus!” A black grandmother’s sweet potato pie truly is Jesus. This just a fact. I really didn’t know the word “repass” was just a black thing, but, yeah, I guess I only ever heard it in my missionary baptist church. “I went to a concert once at The Forum and immediately cancelled all my credit cards” I’m waiting for one of these office scenes to fail, but they never do. If you’re not familiar with the funeral hit “Freak Me” by Silk, check it out!